S. Gao, M. Fivel, A. Ma, A. Hartmaier. (c) With permission from Elsevier, 2017: https://www.sciencedirect.com/science/article/pii/S0022509616307128. A three-dimensional (3D) discrete dislocation dynamics (DDD) creep model is developed to investigate creep behavior under uniaxial tensile stress along the crystallographic  direction in Ni-base single crystal superalloys, which takes explicitly account of dislocation glide, climb and vacancy diffusion, but neglects phase transformation like rafting of γ-precipitates. The vacancy diffusion model takes internal stresses by dislocations and mismatch strains into account and it is coupled to the dislocation dynamics model in a numerically efficient way. This model is helpful for understanding the fundamental creep mechanisms in superalloys and clarifying the effects of dislocation glide and climb on creep deformation. In cases where the precipitate cutting rarely occurs, e.g. due to the high anti-phase boundary energy and the lack of superdislocations, the dislocation glide in the γ-matrix and the dislocation climb along the γ/ γ' interface dominate plastic deformation. The simulation results show that a high temperature or a high stress both promote dislocation motion and multiplication, so as to cause a large creep strain. Dislocation climb accelerated by high temperature only produces a small plastic strain, but relaxes the hardening caused by the filling γchannels and lets dislocations further glide and multiply. 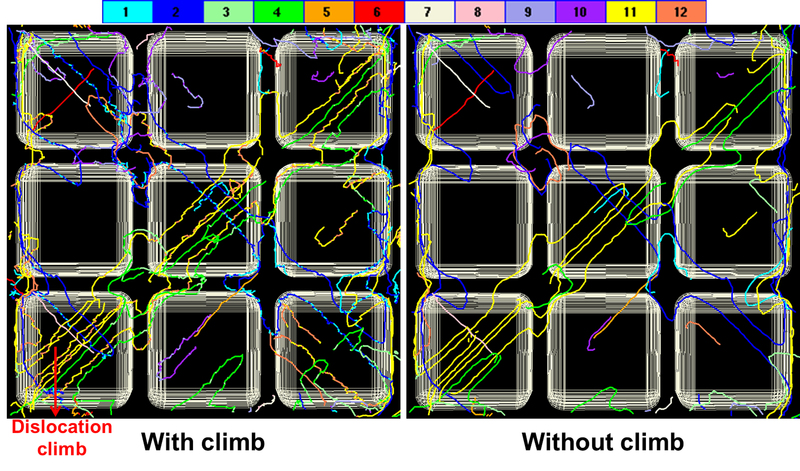 The strongest variation of vacancy concentration occurs in the horizontal channels, where more mixed dislocations exit and tend to climb. The increasing internal stresses due to the increasing dislocation density are easily overcome by dislocations under a high external stress that leads to a long-term dislocation glide accompanied by multiplication.